On Monday I spoke with Louise Round about Boulthurst Way and the Redhill Aerodrome article in the Surrey Mirror. Our consultation sets out the reasons why we currently do not believe Redhill Aerodrome is a good location for a new village, but it will be really important that we listen to views and respond to those. We do need to look at, and very carefully consider, where new housing can be put and the best way of ensuring that new housing is supported by appropriate infrastructure. The Government has issued a prospectus for new towns and villages and they certainly view it as one of the ways of dealing with the housing crisis whilst securing infrastructure. This Council needs to give careful consideration to all the options available to deliver the housing required whilst ensuring we support an environment in which people wish to live and work as well as visit. On Tuesday I attended Oxted Parish Council (OPC) meeting as Parish Councillor. Discussions centred around pubs and the event was well attended by members of the public. There was a presentation from the developers of the Haycutter which is currently closed. They are proposing a significant extension to the existing building to cater for 148 covers (restaurant seats) with 73 parking spaces. It was suggested that this scale of development would be the only way to ensure the future viability of this public house. As this property is in the Green Belt there is a considerable hurdle to overcome as special circumstances would have to be proved at the Planning meeting. The local residents I spoke to seemed supportive of the proposed scheme. Then followed a request from members of the public for the George Inn in Old Oxted to be classified as a Community building to help safeguard its current use. It was agreed that OPC would apply to Tandridge for this classification. On Wednesday my daughter Catherine had a spat on the Oxted Facebook page with OLRG, sticking up for her Dad. This was her last posting. I’m not a child, I’m a 28 year old, mother of 2 with a degree, and a key worker for the National Health Service. I have been forced to move out of Oxted, after spending the first 18 years of my life living there, due to the lack of affordable housing, accountable to an ageing population and lack of development. I now live in East Grinstead, which has just… been voted as the most prosperous place to live in the south east. Their neighbourhood plan, which has already been voted in favour, includes some development, and consequently major restructuring for our town centre which will in turn support local businesses and the residents of the area. A very exciting prospect for a thriving town. I have no issue with “my parent not being universally liked for his decisions”, I was simply wondering why they posted a picture of him next to a quotation which seems to be of no relevance to the truth or his views. Instead of writing a well scripted response to me on Facebook perhaps you would be more advised to spend your time understanding the principle of forming a local plan, it’s intention, and each council’s obligations to do so by central government. She has twenty likes for this (more than I ever had!) when I put it on my Facebook page and added, Really proud of you Dad and all that you do voluntarily for the local community and Oxted. On Thursday I met with the residents of Boulthurst Way to discuss the open space following the Council’s decision to put this site forward in the Local Plan. Firstly, thank you to Stephen and Lucy for hosting the meeting – and also for the glass of wine. I discussed the role of the Council as a land owner and the sites that we are putting forward in the Local Plan process. The appropriation notice is in connection with our role as the landowner and is a legal notice declaring that we are considering the site for development. Anyone who wished to object or make representations is required to respond by 25 November whereas the consultation on sites in the Local Plan is open open until 30 December. With particular regard to Boulthurst Way, we are currently looking at how it could be developed and I will take back the suggestions made so they can be fed into the process. When we put the site forward for possible development it will be with the caveat that significant amenity space must be kept. The options we are considering include – affordable housing, a discounted private rented model aimed at local people and market housing. As land owner, we are keen to retain control over the site and are looking to balance its contribution to the community, alongside the additional housing it could provide. Once we have worked through the possibilities we will be in a better position to share any plans with the local community. I agreed to come back to Stephen and Lucy, which I expect to be in February/March time. On Friday I attended a Remembrance parade at the Council Offices with Chairman of Council Pat Cannon and wife, Jill. My thoughts were focused on my Uncle Bob who went down with HMS Prince of Wales in the South China Sea in December 1941. My aunt, a war widower never remarried is now 96 years old. Afterwards, I was pleased to share coffee and biscuits with members of the Limpsfield Royal British Legion in the Council offices. Robin Parker, husband of Councillor Liz Parker, was also there. What an amazing man who had a pioneering heart transplant some thirty years ago. On Sunday I attended the Memorial Parade in Oxted. 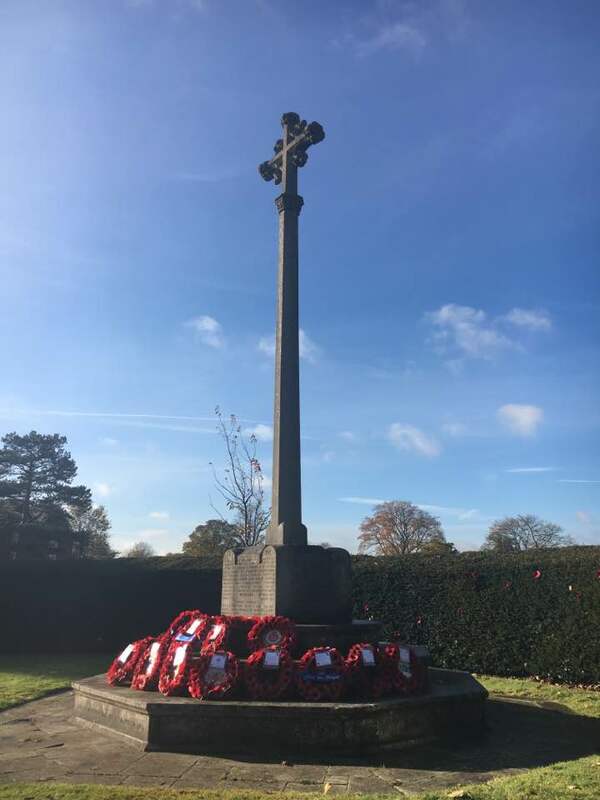 I felt proud to lay a wreath on behalf of Tandridge residents, alongside Nick Skellett Vice-Chairman of Surrey and Karen Weightman from Oxted Parish Council. St Mary’s church was full for The Royal British Legion service of Remembrance where I read the lesson from St Luke’s Gospel. It is an occasion when the community comes together to remember those lost or injured in our two World Wars and other conflicts. I was accompanied by Jayne Godden-Miller representing the Officers and staff at Tandridge District Council. Afterwards, we went back to The Royal British Legion to enjoy hearing stories from the men and women to whom we owe so much.